The scientists who have analyzed the article show that it contains significant inaccuracies, notably for its core assumptions, and misrepresents scientific studies and scientists it cites to make its point. 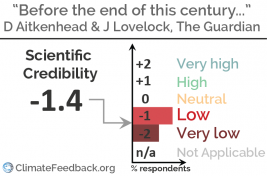 Reviewers also note that the article knocks down strawman arguments that do not represent the state of scientific knowledge (scientists do not claim the ocean will become a “giant acid bath”). "The article nicely introduces some of the emerging science linking Arctic climate change to extreme weather at lower latitudes. 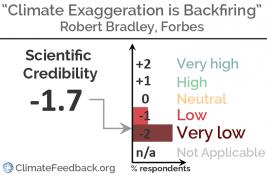 There are no major inaccuracies and the author has sought expert comment form several prominent scientists. 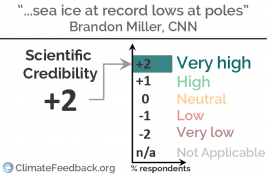 However, the article fails to fully capture the large uncertainty about how Arctic warming may influence weather in places further south and how big this effect might be." This is an incredibly misleading article. It cherry picks a dataset taking measurements 2 miles up in the atmosphere only over land areas that disagrees with the other two datasets that examine the same values... The author is taking a normal modest cooling at the end of a large El Niño event and spinning it completely out of proportion. 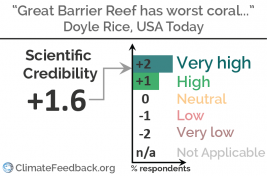 "This article is mostly accurate ... the frequency of massive bleaching events is increasing, will continue to increase in the near future, and these events do not need to occur annually to kill the reef. The variability of El Niño Southern Oscillation on top of the background warming trend of surface temperatures means that we will exceed the bleaching thresholds more frequently." 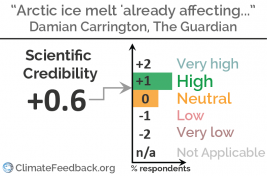 "Well outlined and balanced article, describing the evident link between low sea ice and climate warming and the melt-albedo feedback, but also mentioning the role of weather and short-time variability." 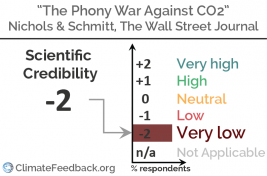 "The article speaks about scientific questions under an "opinion" banner—as if questions about the role of CO2 in the Earth system could be a matter of opinions. For the major final conclusion "With more CO2 in the atmosphere, the challenge [to feed additional 2.5 billion people] can and will be met. ", there is absolutely no scientific credibility, nor support in the scientific literature—it is pure fantasy." "The article is inaccurate in several places and conveys that one must choose between solving immediate problems, such as poverty, and long-term risks such as climate change. We can do both, and indeed must do both if we take poverty seriously, since climate change disproportionately affects the poor." "This article is very interesting because it exemplifies a highly-misleading rhetorical practice that is effective, frequently used, but not easily recognized by the public: "paltering"... A successful palterer will try to avoid being untruthful in each of his/her utterances, but will nonetheless put together a highly misleading picture based on selective reporting, half-truths, and errors of omission..."
"Extraordinary claims demand extraordinary evidence, and Lovelock has not even come up to the standards of providing what the scientific community would consider to be ordinary evidence. 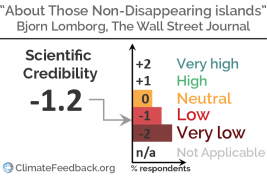 The journalist did not balance Lovelock’s statements with a set of clear statements saying that the vast majority of informed climate scientists (as, for example, represented by the IPCC reports) have reached consensus on conclusions that are diametrically opposed to what Lovelock is saying, and that the IPCC scientists have backed up their statements with a wealth of empirical data, whereas Lovelock is largely opining without providing any substantive evidence to support his rather extraordinary claims." "This picking of quotes that are convenient for Robert Bradley Jr.'s narrative while ignoring what most climate scientists say is one of the most used rhetorical tools of this piece. The other is the use of offensive emotional language to reduce the critical thinking of his readers. People should know that Forbes is nowadays just a blogging platform."